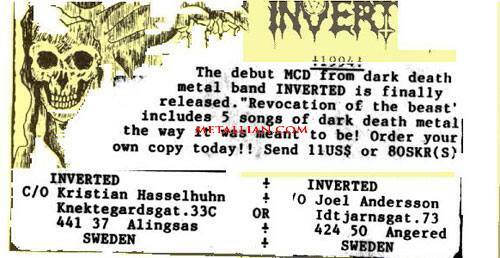 Gothenburg death metal band inverted was formed in 1991 (featuring singer Joakim Almgren) and issued the Tales Of Esteban demo in the same year. Two years later brought the Heaven Defied demo. The demo found favour with America’s Wild rags Records which issued the band’s Revocation Of The Beast EP. The year after brought the Empire Of Darkness single though Regress Records. The band next signed a contract with Belgium’s Shiver Records and issued two albums. There were several line-up changes between the albums and Inverted threw in the towel in 1998. Inverted broke up due to many reasons including the distance the band members had to travel to meet. Drummer Kristian Hasselhun busied himself with his label Voices Of Death Records. A couple of members formed Immersed In Blood. Re-Invocation Of The Beast was a 2014 compilation. The best known band on the Shiver roster, Sweden's Inverted is not a new name. Through the release of a demo tape on Wild Rags, the release of its debut album, the lending of a member to Deranged and other scene activities, the band is far from unknown. Taking a peek at the line-up, one notes that the group has undergone a major change with only the rhythm section remaining intact. Not that it has much affected the music. Inverted belts out death metal, possibly more continental in sound than Swedish that is more close to Massacra than Dismember. The band executes the fast parts quite well, perhaps better than the slower parts while the 'hidden' track tagged at the end of the CD is completely throw-away. Still, Inverted has released a fun and powerful album which stays true to the ideals of heavy metal. - Ali "The Metallian"